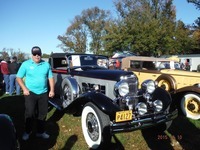 This is the all silver car now silver and black owned by Calvin High at Hershey on Sat. I did not stay for the show but a friend did and sent me this and Keith's car. I think it was plum, then silver, now silver and black. Victor can confirm. I think that is right. When Ralph Bowyer owned it he allowed me to look over the car closely. It was very precisely restored and beautifully done. 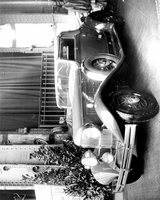 I just wanted to make sure we followed the ownership chain so we don't add a 'new' car to the Royale convertible roster. From October 1931 Automobile Topics. Interesting pic, thanks for posting it! 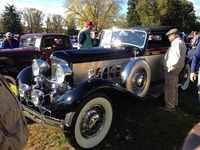 From the Hershey AACA Fall meet courtesy of an AACA member. Note the show only emblem between the headlights. Never noticed than emblem between the headlights before! So, it was a show thing?